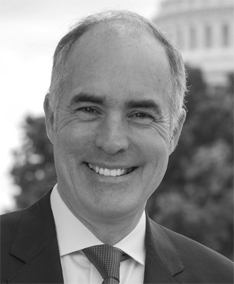 Bob Casey, Pennsylvania’s senior senator was elected to the U.S. Senate in 2006. Since then, he has distinguished himself as a senator for all Pennsylvanians. He demonstrated that he is capable of collaborating with others when he gained Republican cosponsors for Stephen Beck Jr. Achieving a Better Life Experience Act (ABLE), which allows millions of families across the United States to save for the long-term care of their loved ones with disabilities in a tax-advantaged savings account. The Associated Press called the legislation “the most important new law for [those with disabilities] in 25 years.” Additionally, demonstrating his concern for students attending academic institutions, Senator Casey along with Carolyn Maloney (D, NY), introduced the Campus Sexual Violence Elimination Act (SAVE Act), requiring colleges and universities to report and disclose all information about crimes in and around their campuses. Senator Casey believes that the character of a nation is judged by how well it protects and care for its most vulnerable citizens – its children. He believes that healthy, nutritious food is critically important to the health and well-being of our children. That is why he supported the Improving Child Nutrition Integrity and Access Act of 2016 and the Fruit and Vegetable Snack Program in the Farm Bill. Also, he sponsored a bill that would extend WIC eligibility for children to age six, rather than cutting kids off on their fifth birthdays. The Wise Investment in our Children (WIC) Act would also extend WIC certification period for infants to two years, rather than the current one year, so WIC offices can focus on service rather than paperwork. Finally, the senator has been a champion of the state-run, federallyand state-funded Children’s Health Insurance Program (CHIP) program that provides affordable, quality health insurance to children in low-income families who do not qualify for Medicaid. In solid support of Pennsylvania’s middle-class, he has fought to increase the minimum wage, ensure equal pay for equal work and enhance worker protections. Also, Senator Casey has opposed cuts to Medicare, and supported the Family and Medical Leave Expansion Act. He supported the creation of the Consumer Financial Protection Bureau (CFPB), an independent agency that serves as a onestop- shop for consumers to report abusive financial practices such as scams and predatory lending, and promotes financial education, monitors financial markets for risks to consumers and unfair practices. Increasing opportunity also means creating conditions under which workers and businesses can prosper. As a member of the Finance Committee, Senator Casey has worked to pass legislation to make it easier for small businesses to plan for capital investments that are vital to job creation; voted to provide billions for tax cuts to encourage businesses to hire workers; and strongly supported extending tax breaks that promote innovation and research that drives our economy. He has also advocated for increased investment in the roads, bridges, and ports that are vital to the Pennsylvania economy. He also voted for legislation to eliminate tax policies that make it easier for companies to send U.S. jobs overseas. Senator Casey’s commitment to the state’s infrastructure included boosting initiatives that create good paying jobs and grow local economies. In Southeastern Pennsylvania, Senator Casey led the charge to deepen the Delaware River to 45 feet, which will increase by 2.5 million tons the cargo in the region according to the Port of Philadelphia, and, more cargo means more jobs. Senator Casey believes U.S. diplomatic and military leadership are essential to protecting the homeland, as well as U.S. interests and global stability. Senator Casey is a member of the National Security Working Group and former Chairman of the Senate Foreign Relations Subcommittee encompassing the Middle East and South and Central Asia. He has been a Senate leader in efforts to cut off ISIS’ financing and intensify efforts to reduce its hold on territory. In light of all the above, and more, Senator Bob Casey the Democratic Senator of Pennsylvania has earned the endorsement of the Lansdowne Democratic Committee. His record of advocating for the most vulnerable, to defending the middle-class is unmatched. At a time when our country is in precariously uncharted waters since the founding of the Republic, it is comforting to have someone embodying the commitment to the values articulated by the founding fathers; someone who has vowed to protect the environment; someone who is committed to Pennsylvania’s children and the elderly; a man who believes Pennsylvania cannot be a great state without a commitment to education and enhancing the skills of our workers to meet the challenges of the 21st century, and works to attain that objective. Bob Casey is a man of his word. He unambiguously says what he means, and means what he says.